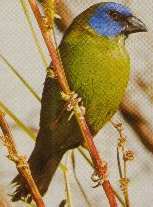 · In Australia the Blue-faced Parrot-Finch is restricted to north Queensland. · It is moderately common in partially fragmented rainforests in an arc between Gordonvale and Ravenshoe. Other sites are more scattered. · It feeds often on the seeds of Guinea Grass and Brachiaria at the forest edge. · Although colourful it is difficult to observe, flushing readily from grasses into nearby trees. · The metallic call is distinctive but is inaudible to many observers.